Using a handling collection of replica pots, tools and artefacts, Graham Taylor will show you how to make your own pottery tool kit, decorate replica pots as well as how to fire them using authentic prehistoric methods. Guy Hagg demonstrates all things essential to Neolithic life, from fire lighting, game preparation using flint tools, early cooking methods to making weapons, bone and antler tools and the everyday utensils used at this time. Join expert Karl Lee, as he demonstrates how Neolithic flint tools were produced using authentic techniques and tools. See a Flint Knapper at work in the setting of Stonehenge’s Neolithic houses. Kim Creswell makes baskets using the primitive flint tools of the Neolithic age. See her work raw materials found in the landscape into a working basket in just one day. Sally and Gareth Pointer will work with a variety of natural fabric crafts over these weekends including cord making, twining, looped weaving, netting and leatherwork. See bone and antler worked and discover how materials were used in the Neolithic period. Bring the family this half-term to uncover the ancient past of these mysterious stones as we explore the history of their role in the lives of ancient man. Watch demonstrations by Neil Burridge of the amazing Bronze Age casting, which helped primitive man to develop. The Stone Age is being brought to life through a fascinating range of weekend demonstrations from the people who made the replica objects on display in the houses and the exhibition. Visitors will understand how Neolithic people turned stones into essential every day tools and other natural materials into pots, musical instruments, clothes and baskets. Watch Bronze Age casting and book onto our very special Heaven and Earth tours which will introduce you to the stars and how they were also essential tools of the Neolithic people living in and using the Stonehenge landscape. Join Corwen Broch, musician and instrument maker, will create instruments from natural materials and demonstrates the sounds of the Neolithic. And expert flint knapper Karl Lee will demonstrate how Neolithic flint tools were produced using authentic techniques and tools. Get hands on with Neolithic pots as Graham Taylor uses a handling collection of replica pots, tools and artefacts to show you how to make your own pottery tool kit, decorate replica pots as well as how to fire them using authentic prehistoric methods. Many of the replica pots you see in the Stonehenge visitor centre and Neolithic houses are made by Graham. He says: “Pottery is one of the commonest finds from Neolithic and Bronze Age sites. There is far more to this prehistoric technology than meets the eye – the craftspeople who created the pottery of the Stonehenge landscape had a deep understanding of their materials and processes. Guy Hagg, one of the volunteers who helped build the Neolithic Houses and also works as a house interpreter, will be demonstrating the essentials of Neolithic life, from fire lighting, game preparation using flint tools, early cooking methods to making weapons, bone and antler tools and the everyday utensils used at this time. Kim Creswell will be making baskets using the primitive flint tools of the Neolithic age. See her turn raw materials found in the landscape into a working basket in just one day. At textile demonstrations, in January and February, Sally and Gareth Pointer will work with a variety of natural fabric crafts over these weekends including cord making, twining, looped weaving, netting and leatherwork. See bone and antler worked and discover how materials were used in the Neolithic period. Watch Neil Burridge reveal the secrets of Bronze Age casting – a huge step forward in the development of primitive societies. The ancient past of the mysterious stones will be explored with families in February half-term as we look at the history of their role in the lives of ancient man. The Neolithic houses were built by volunteers and are based on the excavations of domestic dwellings found at nearby Durrington Walls during excavations in 2007. 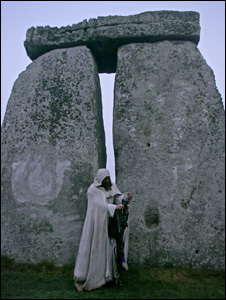 It has been suggested that the original structures may have been the houses of the Neolithic people who built and used Stonehenge. During the winter, Stonehenge is open from 9.30am-5pm with last admissions at 3pm. All weekend demonstrations run between 10am and 4pm.